1. 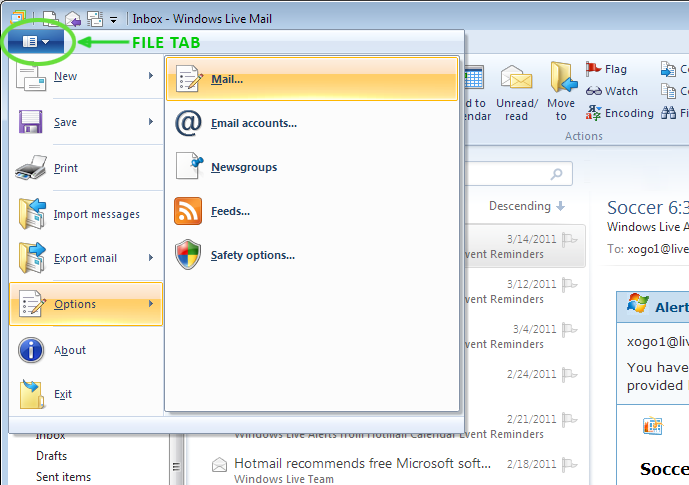 Go to Windows Live Mail and open a NEW MAIL message. 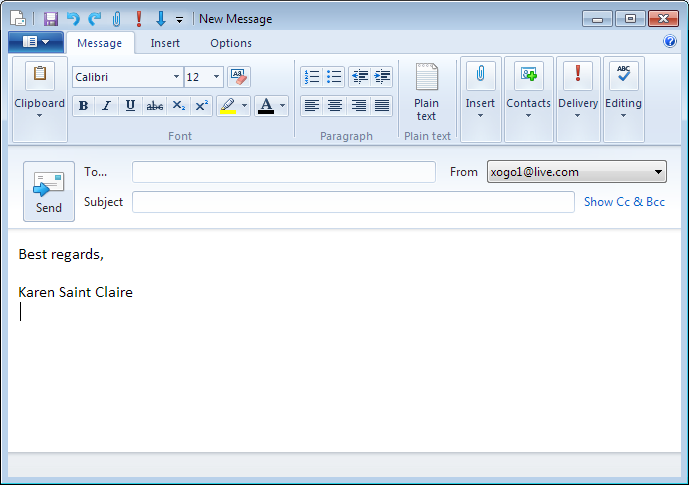 Make sure it’s completely blank (remove any existing signature or stationery) and type in your standard closing text. Then position your cursor beneath your closing text. 2. 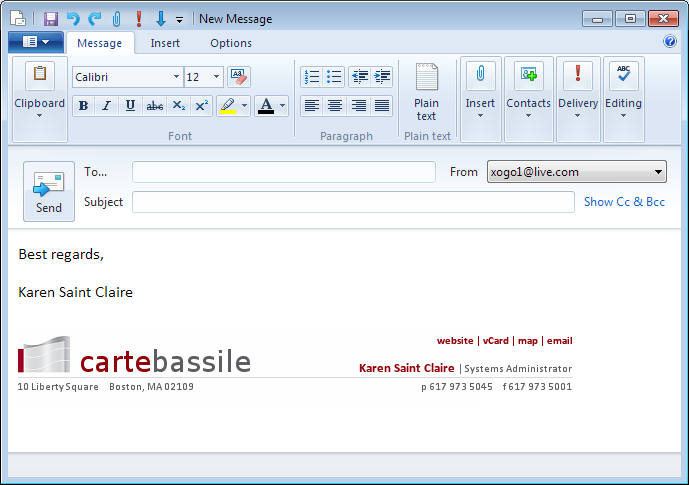 PASTE (Ctrl-v) the graphical signature that you have copied to your computer’s clipboard beneath your closing text. 3. Once everything is set just the way you want it, click the file tab in the upper left corner of your window (Left of the Message tab) and select SAVE AS FILE from the menu. At the top of the dialog box you will see the phrase “Save In.” This is probably set to “My Documents.” You may save your signature file to any folder you want to, but you must remember where you have saved it - you will need to navigate to this folder again shortly. 4. From your inbox, click the top left file tab (Left of the Home tab). Click OPTIONS, then EMAIL. The Options dialog box will appear. 5. In the dialog box click on the SIGNATURES tab. Click the button labeled NEW. 6. 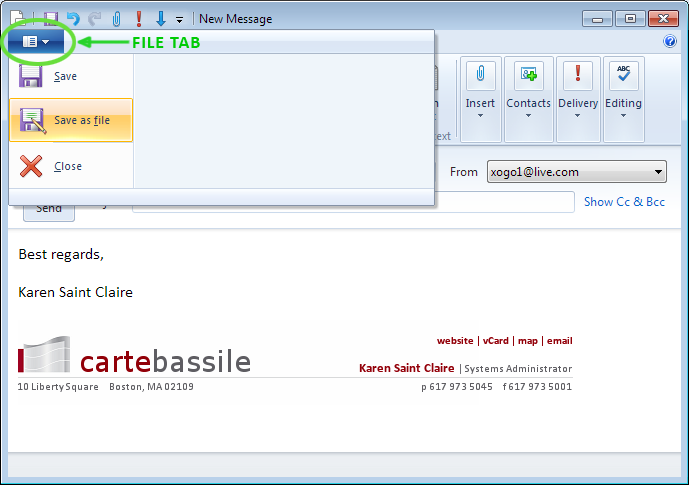 The lower portion of the dialog box is labeled “Edit Signature” - click the option labeled “File” - doing this will cause the BROWSE button to become active. 7. Click the BROWSE button. 8. Now navigate to the folder that you saved your file in (in step 3 above). At the bottom of this dialog box you’ll see a setting labeled “Files of Type”. This is probably set to “Text Files - .txt.” You must change this to either HTML Files or ALL FILES - use the little downward pointing triangle at the right to make this change. You should now be able to find the file you previously saved in the middle section of this dialog box. Double click this file - you will be returned to the SIGNATURES tab. 9. You should see your signature in the list with a number beside it - something like “Signature #1 or Signature #2” - it may make sense for you to use the RENAME function to give it a more descriptive name at this point, although doing so is not necessary. 10. If you only have one signature in your list, it will automatically be your default signature - the SET AS DEFAULT BUTTON will be inactive. If you have multiple signatures in your list, you need to highlight this new one and then click the SET AS DEFAULT button to make this your default signature. 11. 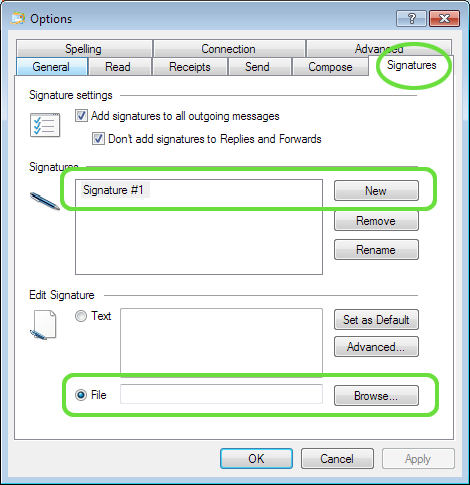 Make sure that at the top of the SIGNATURES tab where it says “Add signatures to all outgoing messages” is CHECKED. 12. Make sure that “Don’t add signatures to Replies and Forwards” is UNCHECKED. 13. Now click the SEND tab. In the top section of this tab you should see six checkboxes. The bottom one is labeled “Reply to messages using the format in which they were sent.” UNCHECK this box. 14. Beneath those six checkboxes on the SEND tab is a section labeled “Mail Sending Format” - make sure you have HTML selected. 15. Now click the COMPOSE tab. In the middle section labeled “Stationery” make sure the checkbox next to “Mail” is UNCHECKED. 16. Click APPLY and then OK to close the OPTIONS dialog box. The next time you click CREATE MAIL your signature should appear.